‘Tis the season to be jolly and what better to wake up to on Christmas morning than a snow-covered model railway display. How’s how Santa makes his. We’d all like a white Christmas but few are lucky enough to get one. Instead, you can easily create your own and have a lovely retro model train running around it too. It takes about a day to make, needs minimal crafting skills, no special tools and will look wonderful on Christmas morning. Before we can get to laying track or adding scenery, you’ll need something to build your festive scene on. Scale trains need a stable, flat, surface on which to run so ideally a plywood board (from B&Q or another DIY store) is recommended but anything firm and flat can be used. Insulating foam, again available from the local DIY store, is also increasingly popular amongst model railway builders as a base. Some people even used several layers of cardboard, the sort used for packing boxes — glued together. If you use this ensure you weigh the layers down while gluing to keep them level. Trains don’t like bumps! 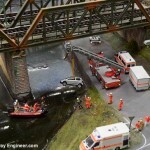 Assuming you’ll be using Hornby OO gauge (the most popular model railway scale in the UK) you’ll need a board of approx. 3ft by 3ft. This is the absolute minimum and will work with the short locomotives and wagons we’ll be using here. If you plan on using keeping your display after Christmas and perhaps running longer rolling stock, passenger coaches or larger locomotives, I recommend going bigger. Once you have the board, you’ll need some track. 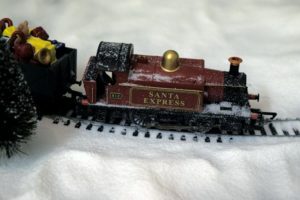 The Hornby Christmas Train Set is great for making a festive seasonal diorama as it has not only the trains but the controller and track to make an oval that will fit your board and it’s a lot cheaper than buying all the parts separately. Alternatively, get eight sections of Hornby R605 1st radius track. Whether you are using the train set or have bought the track individually, connect the track together into an oval. “Take a close look at a section of track. You’ll see that there are two rails. At either end of the track, one of these rails will have a tiny clip sticking out. Look at another piece of track and you’ll see the same. Connecting track together is simply a matter a matter of pushing the track together so the clip on one rail slides under the protruding bit of rail on the next section. If you have the train set, attach the power clips provided to the track. Alternatively, you’ll need to get some track clips, these slide under the rails and connect power to the rails. These come with the Hornby train set or can be purchased independently from Amazon — search for Hornby power connect clip — or a model railway shop (if your local high street has one). Alternatively, for a more secure track connection, you can use wires that are soldered to the clips that hold sections of track together (known as rail joiners or fish plates) such as these. 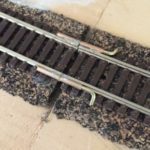 Just pull off the clips at one end of a section of rail and slide on the alternative clips with the wires attached and reassemble the track. When you’re happy with the track, glue it to the base. Normal white wood or craft glue will work fine. Make sure you don’t get any on the rails and leave it to set — 6 to 12 hours should be fine. With the track down, attach the wires from the controller and power transformer from the Hornby set. 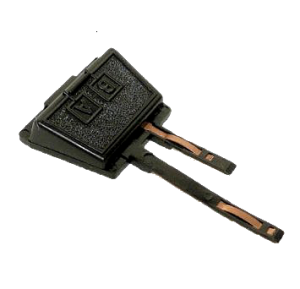 If you don’t have these they, like the power connect clip, can be purchased from Amazon or any good model railway shop. You’ll want a DC controller and an appropriate transformer. 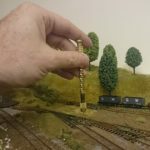 The Gaugemaster single track controller is fully compatible and it’s generally regarded as being superior to Hornby’s basic unit. The wires from the track hook up to this controller. If you’ve got the Hornby train set, place the loco on the track and gently turn up the power on the controller. Your loco should then trundle gracefully around the track. If you need a locomotive and wagons, they’re available new from eBay here. The most common causes of problems if the train doesn’t move are poor connections between the wires and track or where the track connects together. Check the track assembly and wiring and try again. And Now For Some Snow! With the track laid and the trains tested, you can start on the scenery and the snow in particular. If you’re in a DIY mood, you can make your own snow as I’ve described before. It’s a simple technique using white paint, more PVA and Bicarbonate baking powder. Alternatively, if you’ve had enough time in the kitchen in the run-up to Christmas already, you can get ready made snow. This snow stuff is pretty realistic and a lot easier to apply. The grains of this are tiny, as can be seen in the close up shown just above and I have to admit to secretly enjoy working with it. It’s a lot of fun and feels right. The DIY stuff needs careful application, especially between around the rails. 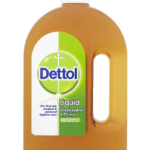 The off-the-shelf stuff is just a matter of spreading wood glue / water mix (60% water) with a few drops of washing up liquid around on the board and scattering the material over it. I use a kitchen sieve to give help give a more equal covering and avoid any accidental spillage when pouring from the main container. To scatter the snow over the track, use the same tried and tested techniques as for ballasting but don’t worry about keeping it off the sleepers. If you’re feeling brave, you can also add snow-covered hills to your scene. To do this just, take some newspaper and scrunch it up into balls and glue them down in the middle of your scene. Then take a few more sheets, soak them in water and lay them over the top of the newspaper balls. Then paint over this with some wood / craft glue and leave to set. Finally, paint it white and then cover with the artificial snow as above. If you just want some small snow drifts, cotton wool topped with the fake snow above can look very effective. The Hornby locomotive used here also doesn’t have a smoke effect but you can pinch some cotton wool into a smoke shape and insert into the funnel to give a fake look that can look quite good, as I did here. You can also create a backdrop to your scene. This encloses the diorama so you don’t see whatever is behind it and makes the scene more believable. Google ‘night sky’ and find some Blue tinted night star scenes. This one is my favourite, with a representation of it shown left. Print this out on a colour printer and glue it to lengths of cardboard cut to the same length as your board and then prop up at the rear of your diorama. It’ll make the whole thing look magical. You can finish off your model railway snow scene with a few last touches. 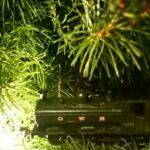 Having your train pass through snow-covered pine trees will make the You could buy some purpose made model railway trees but these are expensive. Instead, a trip to a Christmas market or craft shop will turn up some small-scale pine trees intended for Christmas decorations. I found some lovely little trees going for a £1 each in one of those Christmas shops that tend to pop up in late November. Placing these either side of the track will add a lovely feel. You can also add little figures, such the appropriately scaled Father Christmas, snow man and children on a sleigh. 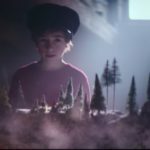 There’s a little expensive at £20 (at the time of writing) but will really bring your scene to life. And that’s it. Your model railway snow scene is ready to go. Place your trains on it, turn up the power and let the Santa express go. 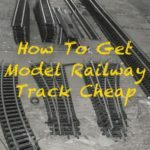 If not using the Hornby train set: Train and wagons, 8x Hornby R605 1st radius track; track controller; track wire connectors. Miniature figures: father christmas and children. 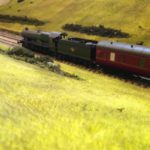 When you’ve made your model railway snow scene, why not share it with the fastest growing community of model railway builders. We’re a family friendly group of like-minded people who would love to see your finished work or help you along the way if you’re struggling. It’s completely free, join here. ← Top marks to Märklin for this but where’s the Hornby version?